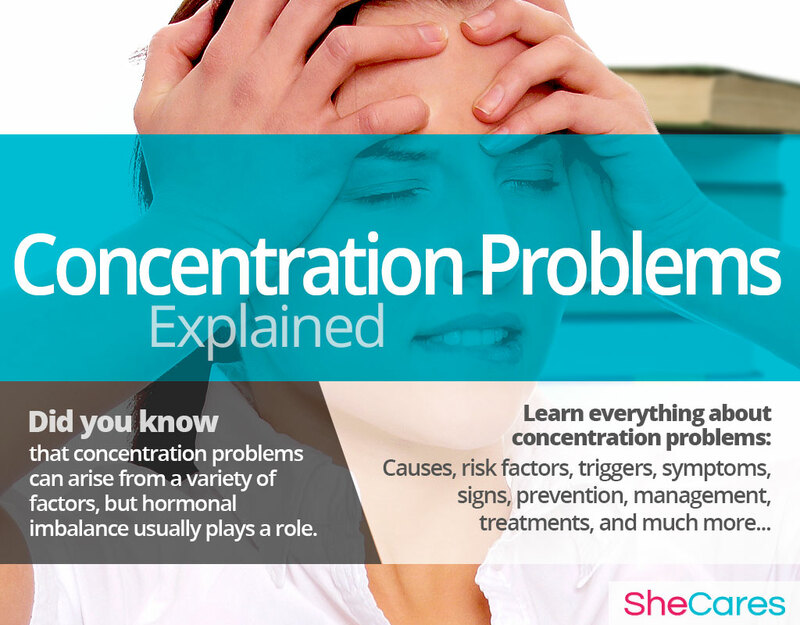 Experiencing concentration problems is common for women of all ages. Many factors such as a perceived excessive pressure by others on academic or job performance, chronic insufficient rest, inappropriate or unhealthy lifestyle habits and resulting hormonal imbalances can play a part in this disorder. As a result, many women can find it increasingly harder to function daily, to stay focused in long or multiple tasks and become more prone to procrastination or excessive daydreaming. This symptom is closely related to memory problems, and they usually present themselves concurrently. Combined, both symptoms can significantly hinder a woman's work productivity, damage her academic performance or even her interpersonal relationships. Continue reading to learn about difficulty concentrating causes, risk factors, symptoms and signs, prevention and treatment options. This disorder can arise from a combination of several factors, but hormonal imbalance usually plays a part. Many pregnant women experience “mommy brain”, which can be exacerbated by fatigue or nutritional deficiencies. Women approaching menopause can get stressed, and fear a more serious condition when they notice concentration problems arising. Most of the times, these problems disappear after menopause and do not evolve into dementia. To say someone suffers from difficulty concentrating means they find themselves persistently unable to carry out long or complex tasks. Difficulty concentrating can be hard to define, since many of its aspects can be very subtle and only noticed to the patient herself. To say someone suffers from difficulty concentrating, brain fog, or cognitive problems means they are experiencing a decreased ability to focus on the same task for an extended period of time or that they find they mind either too racy or too clouded to carry out complex tasks. In addition, confusion and momentary “memory blanks” may be experienced. While there is usually more than one reason for a woman to be experiencing persistent difficulty concentrating, there is an important hormonal factor involved, especially during delicate life events and transitional phases like puberty, pregnancy, post-partum, nursing and menopause. It is difficult to accurately establish the different ways that concentration problems may present themselves, since the individual experience of them can be drastically different from woman to woman. However, there are two criteria that can help identify ways in which this symptom may vary for the individual woman: intensity and frequency. In order to understand the processes behind the appearance of problems with concentration, please continue on to the next section to read about their hormonal and non hormonal causes. Although a lack of attention is often thought to be rude, in many cases, it is not an intentional slight. Many people suffer from difficulty concentrating due to a number of possible factors. While these people may have trouble focusing on a conversation, it is not malicious or intended to be rude. Women are often concerned when they experience increasing difficulty concentrating, poor short-term memory, and fuzzy-thinking during middle age. Learning about the causes of concentration problems provides the key to understanding how to prevent and treat these troublesome attacks. While the exact causes of concentration problems are complex and not completely understood, most doctors and researchers believe hormonal changes are one of the primary causes of concentration problems among women of reproductive age. In addition to these completely normal hormonal causes, other factors and medical conditions can, in more rare instances, cause concentration problems such as brain fog or memory lapses, or may contribute to set them off. Continue reading to learn more about both the hormonal, and other, causes of difficulty concentrating. Hormones are chemical messengers that control every organ in the body. When fluctuations occur, organs don't receive the correct signal to function adequately, so hormonal disorders occur. In this sense, we can say that problems with concentration are caused largely by the hormonal fluctuations during the transitions women go through during their reproductive life. The hormones estrogen and progesterone influence the production of serotonin, which is a neurotransmitter that acts as a “feel-good” chemical inside the brain, enhancing moods, and regulating appetite, sleep, sexual desire and memory. 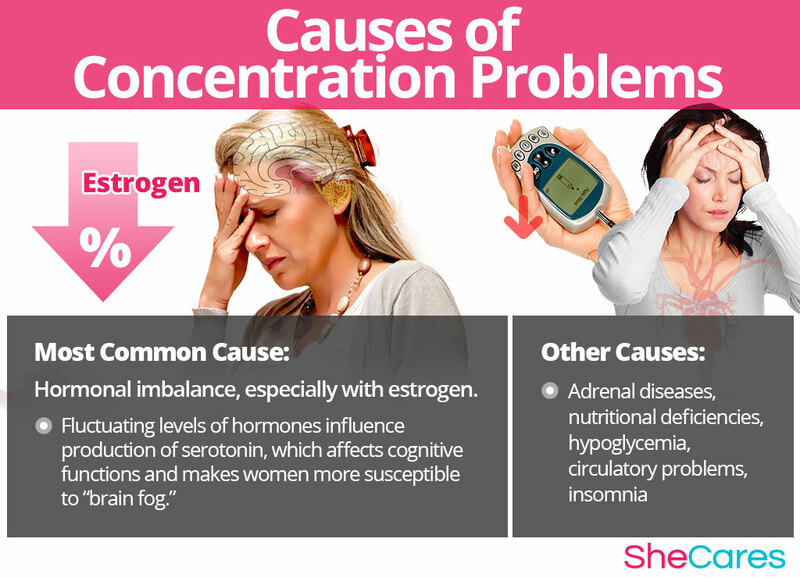 Medical researchers have found that fluctuating levels of hormones, especially estrogen, make women more susceptible to develop problems with concentration and “brain fog”. This happens not just because estrogen and serotonin levels affect cognitive functions directly, but also because hormonal imbalances usually express themselves with other symptoms that can also contribute to a generalized feeling of fatigue or low moods, such as insomnia, anxiety and forgetfulness. Hence the reason why more women experience problems with concentration and memory during times of significant hormonal imbalance - puberty, PMS, menstruation, pregnancy, and menopause. The estrogen deficiency or dominance during these stages causes levels of serotonin to become unstable as well. If hormone and serotonin levels are not regulated, women may experience difficulty concentrating, lapses in their short-term memory, in addition to a depressed state, trouble sleeping soundly and fatigue, as well as many other psychological and physiological disturbances. Furthermore, there are also specific hormonal causes according to the stage of a woman's reproductive life in which this disorder appears. These specific hormonal causes, combined with other factors, can influence a woman's individual experience of problems with concentration around PMS, or during puberty, pregnancy, the postpartum period, and menopause. PMS is a consequence of hormonal fluctuations linked to the menstrual cycle. It is a collection of disorders, which may include problems with concentration, among others. Puberty is the stage in which a girl's body begins to produce reproductive hormones; these and other factors, such as academic pressures or problems with self-perception, can contribute to concentration problems during puberty. Pregnancy leads to extreme changes in the production of reproductive hormones, which along with other factors, typical of pregnancy, like morning sickness and nutritional changes, may lead to concentration problems. Postpartum and breastfeeding is another stage where reproductive hormones are imbalanced, leading to different hormonal disorders, like problems with concentration. Menopause is the stage in a woman's life when production of reproductive hormones naturally declines, signaling the end of a woman's fertility. As well as hormonal imbalance directly, other symptoms of menopause can also influence a woman's experience of concentration problems. While hormonal imbalance is the major underlying cause of difficulty concentrating during a woman's reproductive life, expert also point out that attention problems, brain fog, and cognitive disruptions may be caused by other, less common, underlying conditions. These conditions include adrenal diseases, nutritional deficiencies, and chronic infections, among others. Keep reading to learn what these risk factors and triggers are that have such a profound effect on a woman's experience of concentration problems. Depression can express itself different ways among people of different ages and genders. If you are feeling disconnected, extremely tired, lonely, or any other symptoms of depression - even without the crushing sadness many people expect from depression - make an appointment with a doctor to see if you might be depressed. 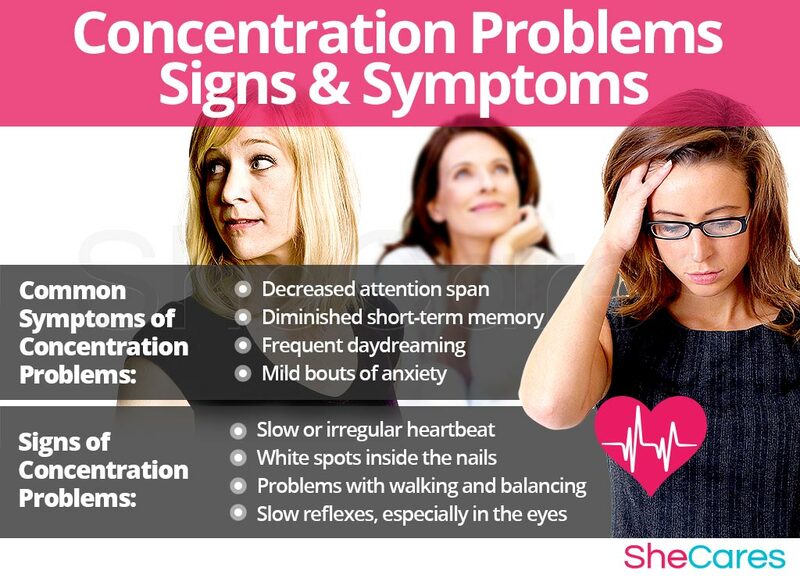 Some women are more likely than others to suffer from concentration problems for inherent psychological, behavioral and health reasons. These predisposing factors can affect a woman's hormone levels and increase the chance that she will develop difficulty concentrating during her reproductive life. Continue reading to learn about the triggers of difficulty concentrating. In addition to long-term risk factors, difficulty concentrating can also be triggered by certain environmental phenomena and behavioral habits. Avoiding these environments or habits as much as possible may help to avoid the onset of cognitive-related symptoms such as concentration or memory loss. These include habits like spacing out meals or surrounding circumstances, like stressful life events. There are also some substances and lifestyle choices that have been linked to both increased frequency and severity of problems with concentration. 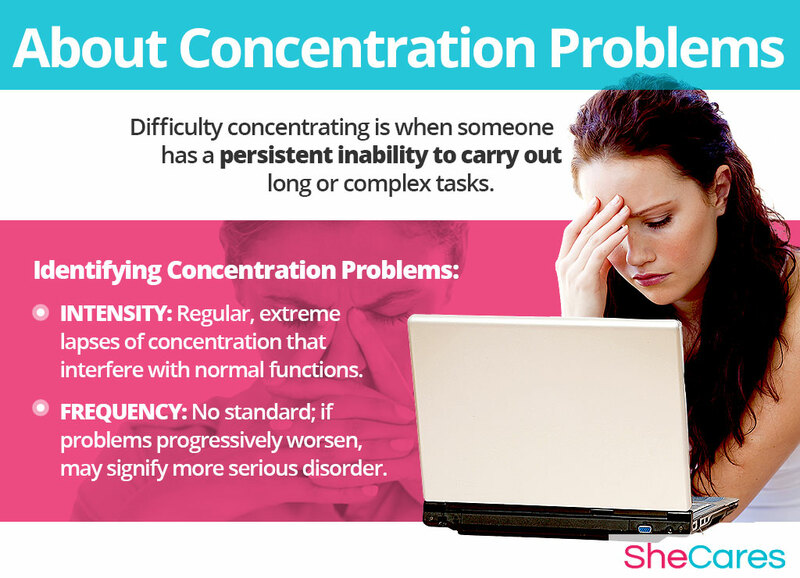 Click here to learn more about the risk factors and trigger for difficulty concentrating. While ADHD is thought of as a problem for children, the symptoms of ADHD can actually persist into adulthood - about 60% of kids with ADHD will become adults with ADHD. Additionally, at least 80% of adults with ADHD were not diagnosed as children will never seek help for their symptoms and receive a diagnosis. Because each woman has different responsibilities and a different way of fulfilling her personal schedule, all women experience the symptoms of difficulty concentrating differently. However, many symptoms of difficulty concentrating are common for women going through a phase of hormonal imbalance. Trouble multitasking or carrying on relatively complex tasks that used to represent no problem. To diagnose and identify the symptoms of difficulty concentrating, a doctor must typically perform four procedures. First, they should review the patient's medical history; then, they should conduct a physical exam, followed by a neurological and psychological examination. The doctor may order some additional tests, if necessary. Concentration problems are, in the large majority of cases, a temporary sign on imbalanced hormones, especially among pregnant women or those approaching menopause. However, in some rare cases, this disorder may be an alert sign of a more serious condition that should receive immediate evaluation by a registered physician. In such cases, the disorder will usually be accompanied by certain warning signs. Women who experience severe and frequent difficulty concentrating may wish to treat or even prevent them. Keep reading below to learn about how to prevent and manage problems with concentration. While it may be difficult to keep yourself focused on the task, reading can actually help improve your concentration abilities over time. Learning how to focus on the text has a beneficial impact on your brain learning to keep itself focused on any one thing at a time. 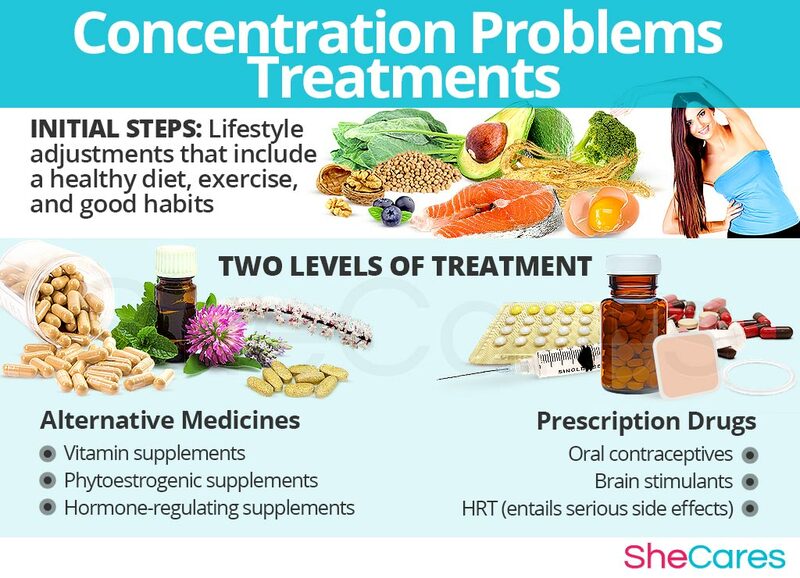 While there is no single way to completely prevent problems with concentration, just as there is no way to stave off hormonal process, there are a few steps that a woman can take to lessen her chances of developing severe difficulties concentrating, or to minimize the impact or length of time in which they affect her. In this sense, lifestyle changes for prevention are extremely important, especially with regard to diet, exercise and healthy habits. Moreover, a woman may seek ways to complement these lifestyle approaches with the use of supplements that help to enhance the endocrine system and, therefore, help to prevent or ease the symptoms of hormonal imbalance such as difficulty concentrating. Continue reading to learn more about lifestyle changes for prevention of concentration problems. For women who are already going through the disorder, prevention may not be possible if concentration problems already appeared. Fortunately, there are many ways to manage them in order to prevent the “flare-ups” or lessen the intensity of the symptoms. Keep reading to learn about the different ways to manage concentration problems. Wherever a woman happens to be when experiencing difficulty concentrating, or if she recognizes that she's fatigued, “spaced-out” or daydreaming excessively, there are effective ways manage the disorder. Making minor daily changes and avoiding triggers can make a huge difference for women who are trying to manage their concentration problems. There are general tips that women of all ages may use, such as changing their working environments, changing their schedules, or keeping a positive attitude. While these measures often help to reduce the frequency and intensity of concentration problems, they are unable to treat the root of the problems, which is hormonal imbalance. However, there are several natural treatments that can treat the hormonal causes of difficulty concentrating. Please continue to the next section to learn more about treating difficulty concentrating. Keep reading to discover treatment approaches for concentration problems. Frustrating and worrying if not understood, experiencing difficulty concentrating can damage a woman's productivity and her ability to organize her life - on a personal, sentimental and social level. Luckily, it is more than possible to find an effective treatment for problems with concentration. Three levels of approaches can be considered for treating concentration problems. These are categorized as: (1) Lifestyle Changes, (2) Alternative Medicine and (3) Pharmaceutical Options. 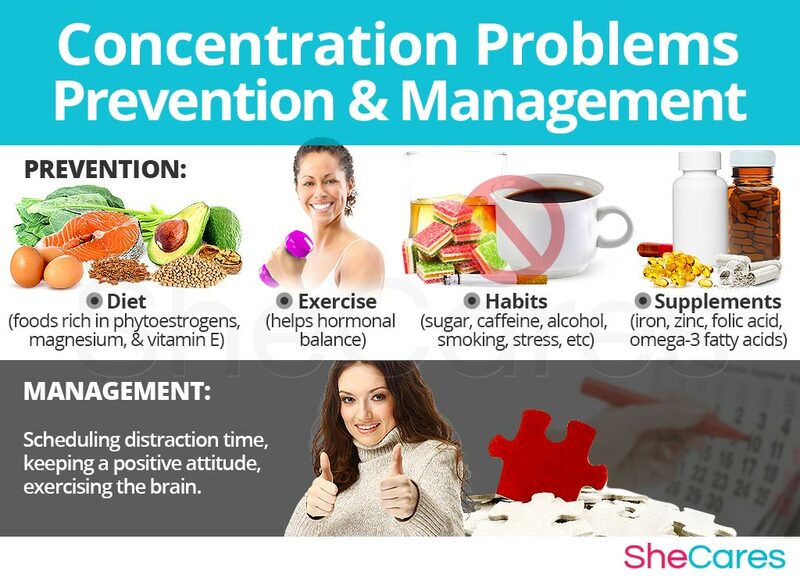 Women are encouraged to begin with the least risky approach to concentration problems treatment, lifestyle adjustments. While these are often effective at curbing the disorder, they alone do nothing to address the most common cause of difficulty concentrating in women -hormonal imbalance-. Fortunately, alternative medicine can be combined with lifestyle changes to provide a safe and effective concentration problems treatment. While medical intervention is not usually necessary to treat concentration problems, some women may wish to consider drug options if they are unable to find relief from natural treatments. For women considering this option, it is important to understand, and carefully weigh, the risks associated with such concentration problems treatment. This primary level of treatment involves the least amount of risk, though conversely it requires the highest amount of self discipline. Many times some simple changes in lifestyle can reap huge benefits in fighting difficulty concentrating, and achieving a higher overall level of health. Fundamentally, an improved diet, regular exercise and healthy habits can do a woman a great service. While these changes will help alleviate problems with concentration, they do not address the problem directly at the hormonal source and so further treatment may be necessary. Alternative medicine has proven to be excellent for treating concentration problems in a safe and natural way. Alternative approaches involve little to no risk and can be an extremely effective way to treat concentration problems. In the case of herbal supplements, there are two main types that can be used: phytoestrogenic and hormone-regulating herbal supplements. These supplements, like black cohosh or ginkgo biloba, contain plant-produced estrogens that, when ingested, can help a woman replace the missing estrogen inside her endocrine system. This way, they may reverse estrogen deficiency and treat the symptoms caused by this particular imbalance. They are mainly effective for women who are approaching menopause, because they are most likely to suffer from estrogen deficiency. However, women in other stages of life such as puberty or pregnancy may not find them as effective or as safe. These supplements, including Macafem, stimulate the body's natural hormone production, because they nourish the pituitary and the endocrine system directly and enable it to produce natural hormones more efficiently. This ultimately results in reversing estrogen deficiency, but also in balancing other important hormones such as progesterone or androgens. These supplements can be considered the safest and most natural way to treat the underlying hormonal imbalance behind most women's concentration problems. Additionally, there are other types of supplements that can also alleviate the symptoms of concentration problems, or at least make them more manageable, including vitamins and other herbal supplements. A combination of approaches is usually the most effective route to take. Lifestyle changes combined with alternative medicine will most likely be the best way to alleviate the symptoms of difficulties concentrating. However, for some women the symptoms will be so severe that a more drastic treatment is necessary. Interventions at the third level involve the highest risk and often the highest costs. In addition, some treatments listed here may not be as effective for women at all life stages, and others may pose serious risks for women who are pregnant or breastfeeding. It is strongly recommended to speak to a licensed physician before starting any pharmaceutical treatments for concentration problems. There are two main types of pharmaceutical options that can be prescribed to treat concentration problems related to hormonal imbalance: hormone-regulating medication and brain stimulants. These three levels of approaches are not mutually exclusive. A woman may use different approaches at different times or any combination of them, depending on the duration and severity of symptoms. Today more and more women find that dealing with symptoms of hormonal imbalance is best accomplished via a combination of healthy lifestyles and alternative treatments. Ray, Y. (2000). Significance of abnormally high or low hemoglobin during pregnancy. American Journal of Family Nutrition, Vol 72:1, 272-279.